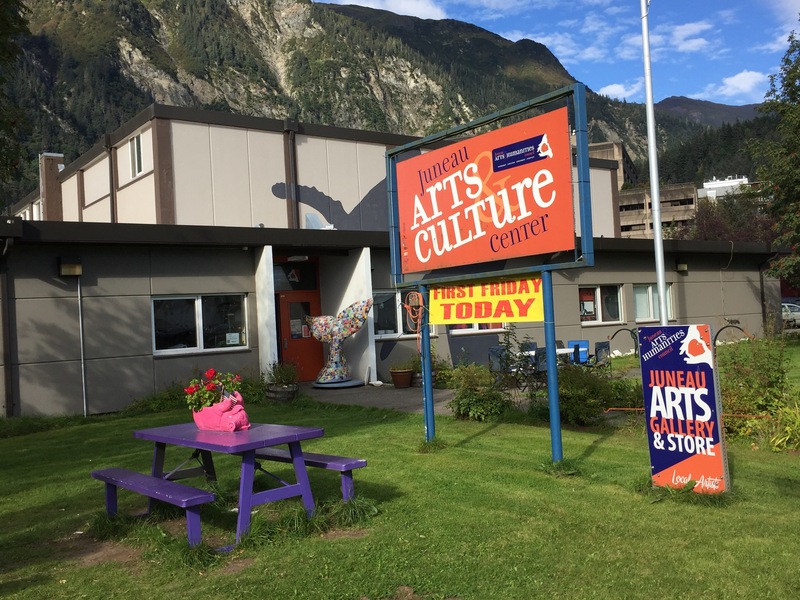 The Juneau Arts and Humanities Council is a local non-profit that serves various local and regional artists. The facility offers a location for artists to show work in the gallery, sell work in the lobby shop, and rent space to offer a variety of workshops and performances. 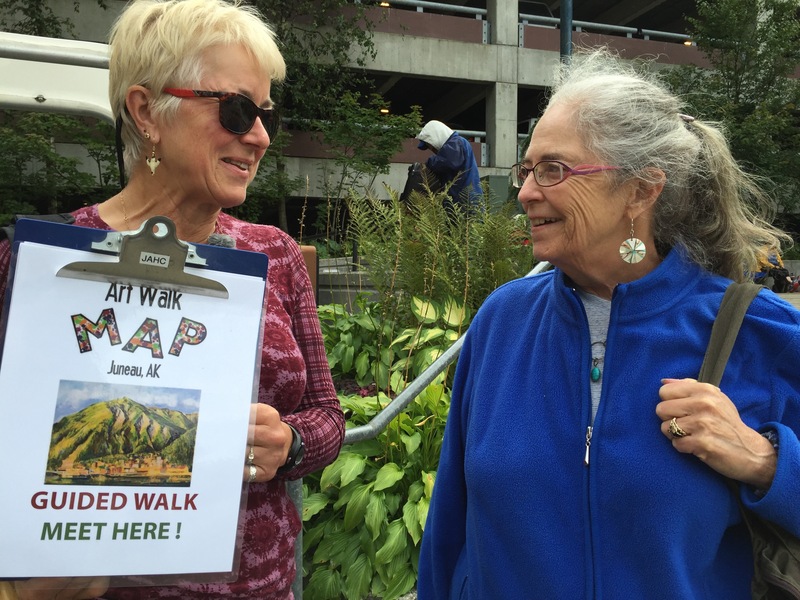 I signed up for an Art Walk that they offered on Sunday thru Wednesday during “season” it is an excellent way to, in a matter of several hours, get an overview of the arts in Juneau. The tour potentially stops at about 32 galleries, public art displays and studios. Our guide, Deb Rudis, is an active member of the Juneau Arts community and it was a pleasure to be with her. It turned out that there was just one other person on the tour, another journalist, Scott Burton, who was doing a story about the Art Walk for the local radio station KTOO a not-for-profit Juneau-based private corporation that provides a variety of telecommunications services (radio and tv) to Juneau and statewide audiences. Here are some of the highlights from our walk. This Mural, facing the Gastineau Channel was painted by local artist Dan DeRoux in 1986. 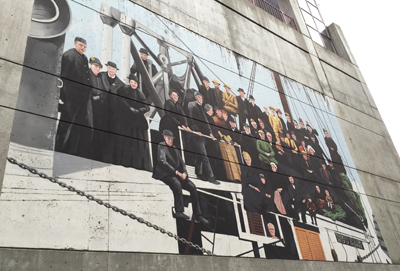 This wall mural depicts a photograph of turn-of-the-century passengers arriving by the steamship Ancon. The faces are those of Juneau pioneer descendants. 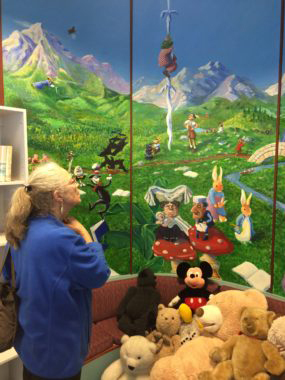 Children’s Storybook Characters Mural (detail), Dan DeRoux. This is a mural of popular children’s fairy tales, stories, and nursery rhymes. Hard Rock Miner, Ed Way, 1980, bronze sculpture, Marine Park Sculpted by local Juneau artist Ed Way, 1980. 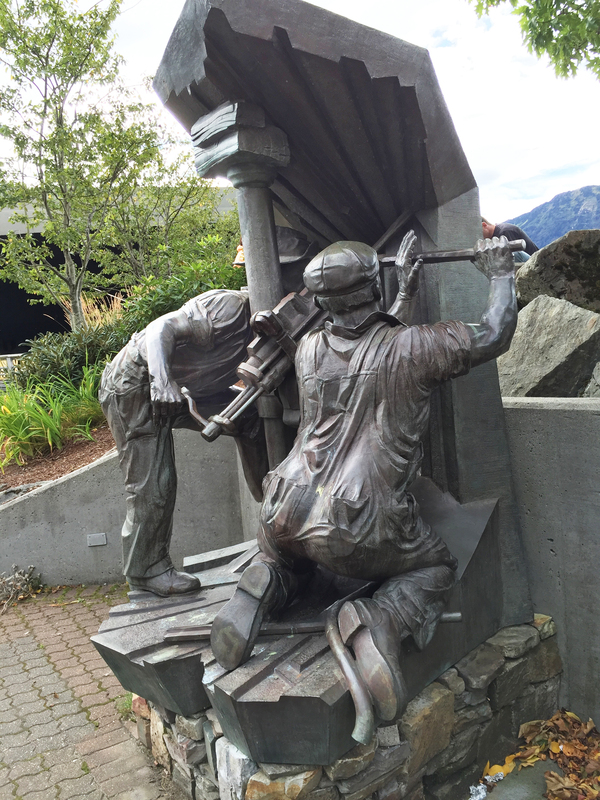 This cast bronze sculpture depicts hard rock gold miners working underground using a double jack drill. Trickster Company: Rico Lanaat’ Worl, Christy NaMee Eriksen, and Crystal Kaakeeyáa Worl Demientieff Studio, This is a shared studio space. 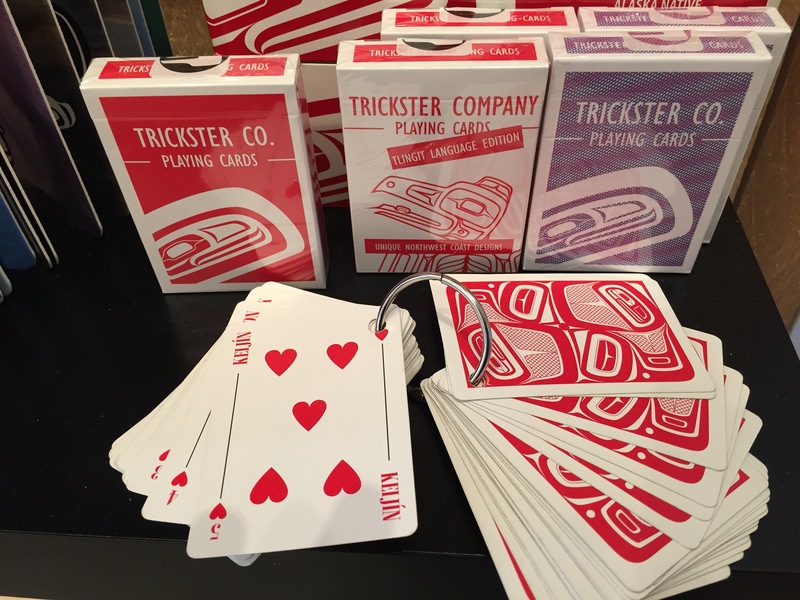 Playing Cards by artist Rico Lanaat’ Worl (Tlingit/Athabascan) of Juneau. 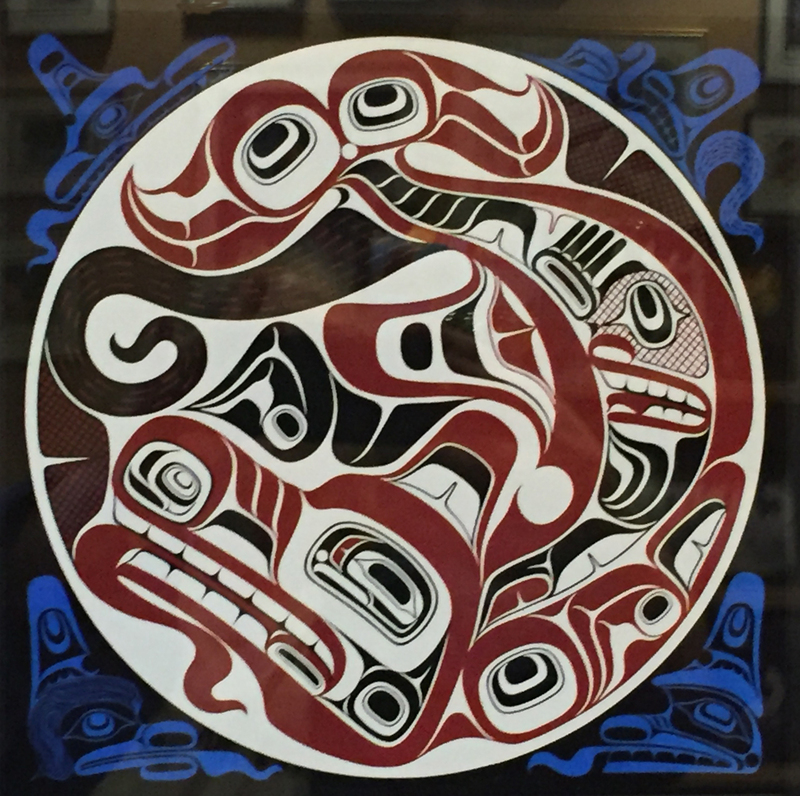 His art is a focused study in learning Formline design, the traditional design style of the Indigenous Northwest coast. Walter Soboleff Building: Sealaska Heritage is a regional Native nonprofit 501(c)(3) corporation founded in 1980 to promote cultural diversity and cross-cultural understanding through public services and events. SHI also conducts social scientific and public policy research and advocacy that promotes Alaska Native arts, cultures, history and education statewide. 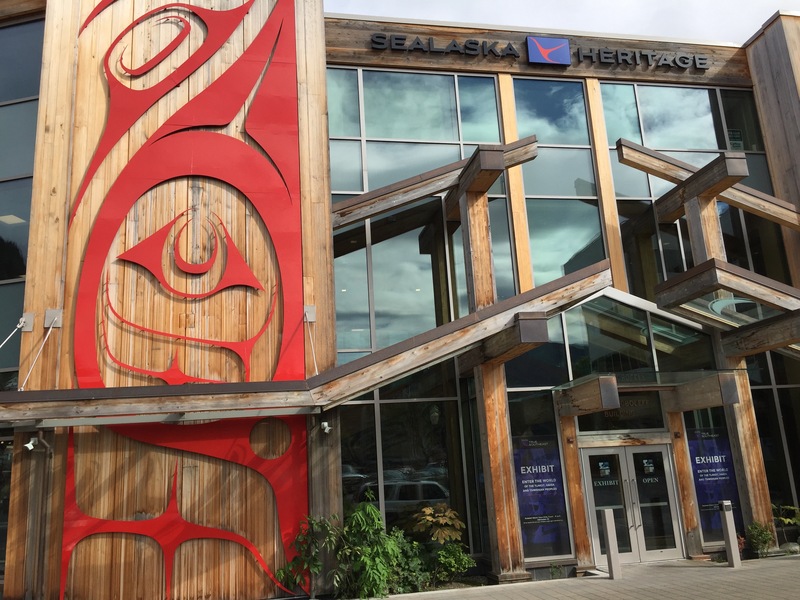 Its mission is to perpetuate and enhance Tlingit, Haida, and Tsimshian cultures of Southeast Alaska by offering numerous programs promoting Southeast Alaskan Native culture, including language and art. 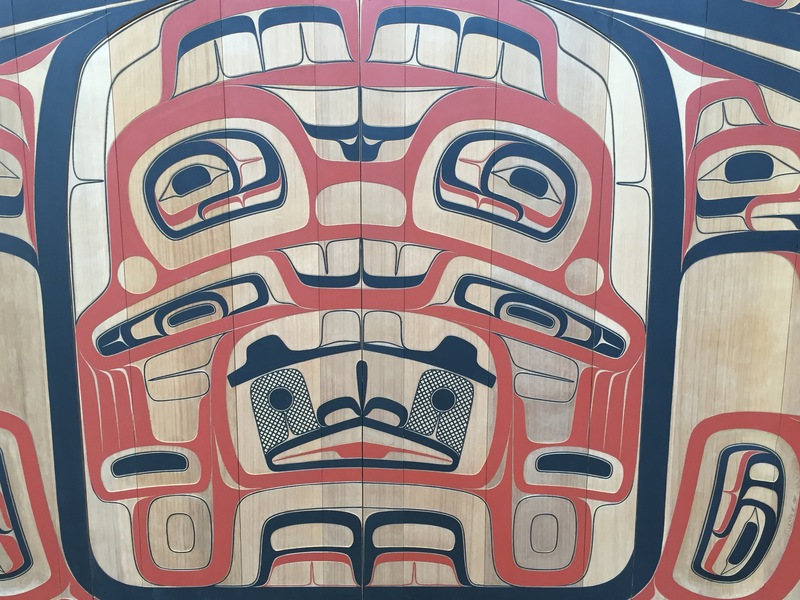 Greatest Echo: Haida artist Robert Davidson, 2015, designed the 40-foot metal panels on the exterior of the building. The design represents a supernatural being called the “Greatest Echo” — a theme chosen by Davidson because Dr. Walter Soboleff, the building’s namesake, echoed the past to bring it to the present. 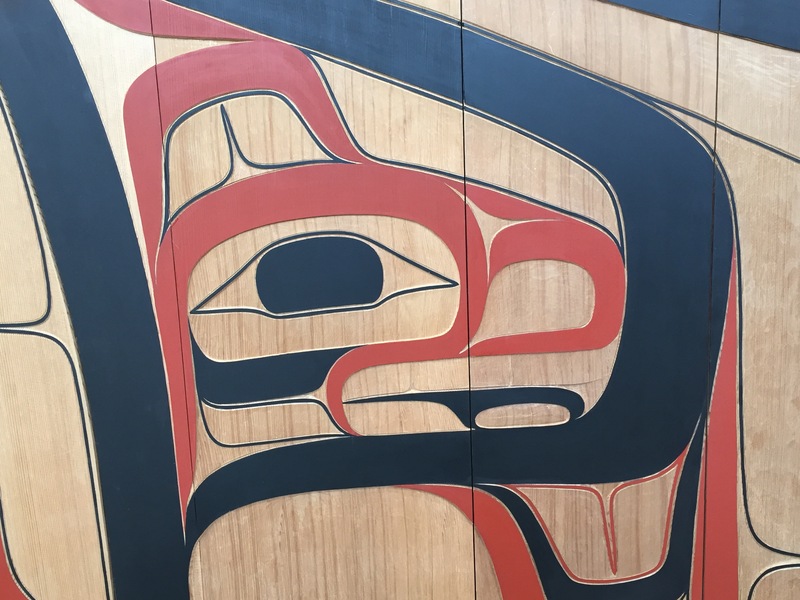 Am’ala: Wil Mangaa da Ha’lidzogat (Am’ala: He Who Holds up the Earth): (detail)Tsimshian artist David A. Boxley, 2015, carved and painted cedar clan house front (detail) (inside the foyer). At almost 40 feet wide by 15 feet high, it is thought to be the largest, carved-and-painted Tsimshian house front in the world. The center of the house front tells the Tsimshian story Am’ala: Wil Mangaa da Ha’lidzogat (Am’ala: He Who Holds up the Earth). A tiny door in the belly of Am’ala leads into the clan house, formally named Shuká Hít (Ancestors’ House) in a ceremony. 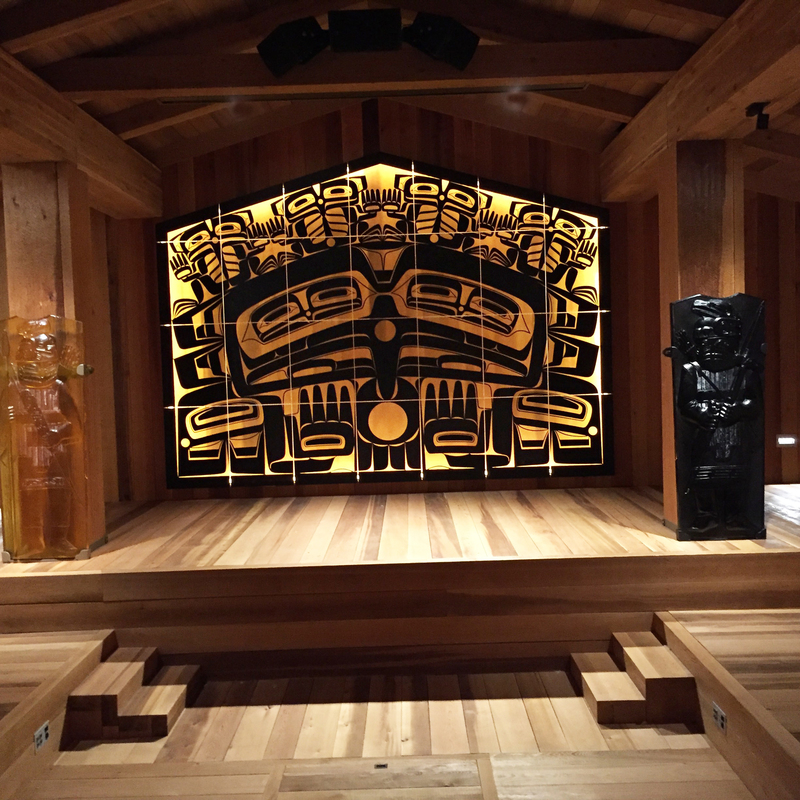 The Clan House, named Shuká Hít in a ceremony, is modeled after the traditional clan houses historically seen throughout Southeast Alaska. It includes a central “fire pit” and tiers for communal activities. A traditional clan house would have included a wooden house screen with posts on one side, but—in a nod to the modern world—they have rendered them in glass. In the corner of the clan house is the carved hand-print of a child. The placement of a handprint or “X” in a clan house is an ancient practice and was done during the grand opening ceremony for the building. Shuká Hít: you will see the largest glass screen in the world, made by the Tlingit glass artist Preston Singletary. Preston is internationally celebrated for his innovative creations, which use a medium not known in pre-contact times. His piece measures 17 feet wide and 12 feet high at its peak and is rendered in carved, amber-and-black glass. From SealaskaHeritage Introduction to Formline Design Art Kit: What is today called the formline system is the foundation of Northwest Coast Alaska Native design (2 & 3 dimensional). As the primary painted-image format of the Tlingit, Haida and Tsimshian peoples of Southeast Alaska, …formlines vary in width (hence their name) changing thickness as they flow around corners. An interconnected web of formlines is used to compose a creature image or design. They may represent stories of Raven and other creatures, historic events, clan crests, or other concepts including clouds or glaciers. … The core building-block shapes of formline design are the ovoid and U-shape. These design elements are similar in form, and the two shapes function in a cooperative way; working together to create visual balance (symmetry), and harmony in design flow and movements. The Ovoids act as visual centers, or sources, from which U-shapes flow to define movements within a design or to represent wings, fins, tails, etcetera. 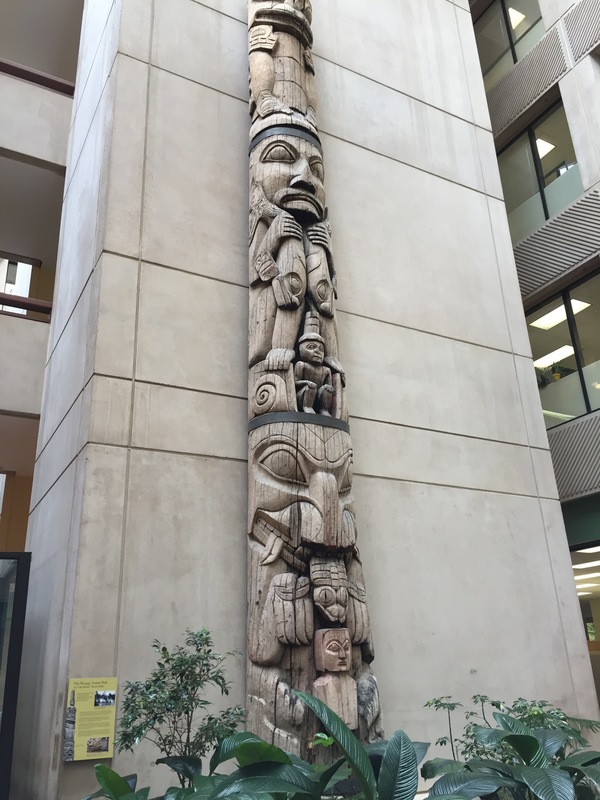 State Office Building: Wasgo Totem or Old Witch Totem, Haida carver Dwight Wallace, 1880. 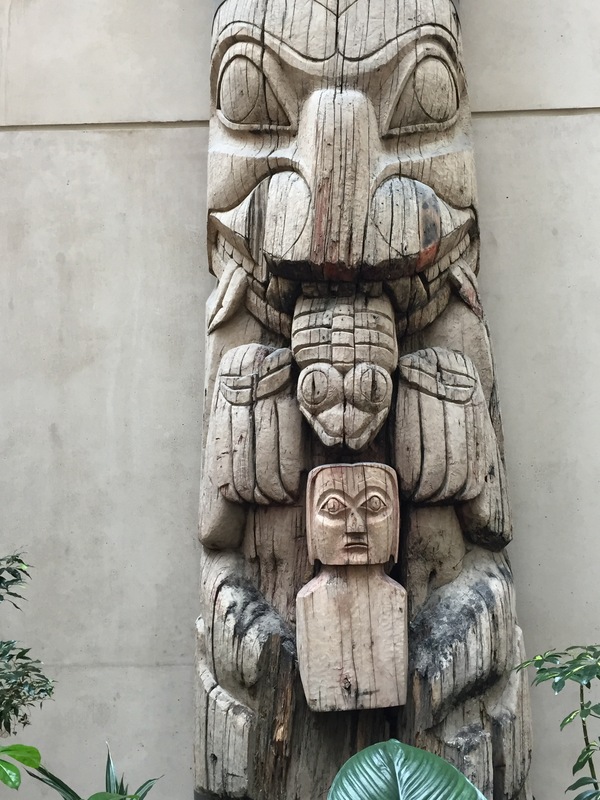 The Haida totem pole originally stood in the village of Sukkwan near the southern end of the Alaska “panhandle.” The top two figures represent a Haida man atop a bullhead, from a traditional Haida story. The remaining figures relate to another story about a young man with special powers obtained from a supernatural water creature “Qaasgo” depicted on the pole in human form lifting two whales.